100.Aleksandar Janicijevic – JavaMuseum 2010 – Celebrate! used technology (software etc): psychogeographical perfomance recorded using digital camera, location and information found using google search, maps and wikipedia, photoshop and other adobe software are used to create site. During psychogeographical or mythogeographical walks [DRIFTS] one is expected to shift focus from one plain to the other. Most of the time a mental reaction is established early on. Senses are overwhelmed with primary ambience leading to the state of open minded “blindness”, entangled by the forces of decisive attraction. In my case occasionally “recomposed drift focus” glides [drifts?] to the unexpected or sights usually unrecognized as significant. I call them: psychographs. Psychogeography is a window to the urban future. Psychographs are illustrative individual examples, they are recorded moments of sensuous touch by genius loci. Everyone has the right to find in the cities the conditions necessary for his or her political, economic, cultural, social, and ecological realization while assuming the associated duties of solidarity. 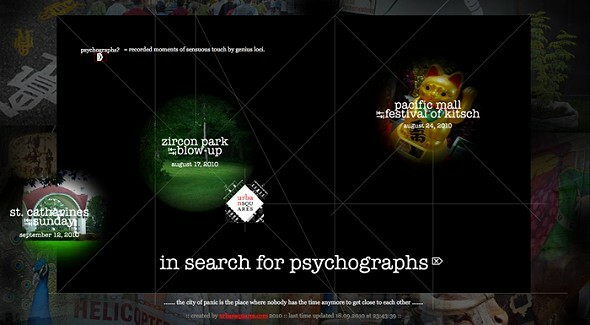 Psychographs are items, points, stages, elements in psychogeographical search to help us understand the multiplicity of language of urban space. Starting point in everyday practice is opening your mind and of course all other senses. Positioned to absorb you are focused on the place itself, genius loci [spirit of the place] is beginning to expose to you “psychographs”, small individual scenes preparing you for the powerful experiences in longer and more purposely oriented psychogeographical walks – drifts. When made in common praxis genius loci is willing to reveal – uncover things otherwise deeply hidden or with unrecognizable importance. that is when you notice that shifting focus suddenly makes thing fundamentally changed. 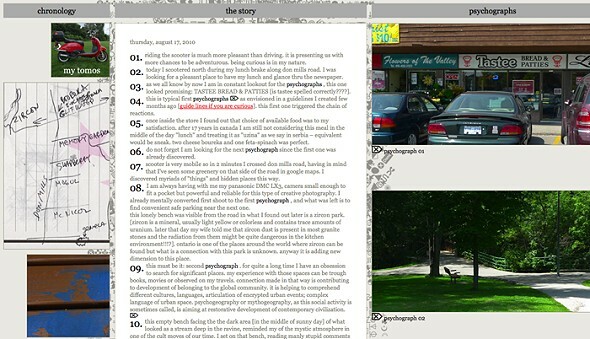 there are only three instances recorded now [september 2010] in this work, I am planning to add many more, site is intended to be ever expanding and influenced by other participants and contributions.